But Oscar has a secret. He knows that parents bring their teens to Candor to make them respectful, compliant–perfect–through subliminal Messages that carefully correct and control their behavior. And Oscar' s built a business sabotaging his father's scheme with Messages of his own, getting his clients out before they're turned. After all, who would ever suspect the perfect Oscar Banks? 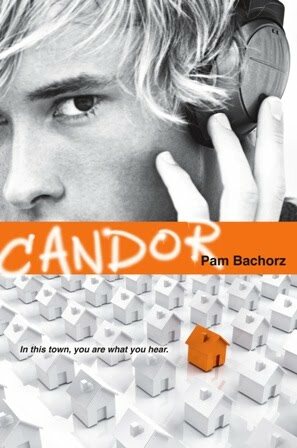 Candor definitely has an original premise. Even the tiniest detail in Oscar's perfect world is controlled by his father's brainwashing recordings. Little does Oscar's father know that Oscar is the one person who may be able to destroy his little utopia. At first, I didn't like the way Oscar used his knowledge of the recordings. It seemed like he almost benefited from his father's plans by charging his clients for his aid in escaping Candor. Then, as the story progresses and Oscar meets Nia, his perspective changes drastically. It wasn't all that easy for me to relate to Oscar because he's a teenage boy and he's cocky and confident. Still, I could sympathize with him as he fell for Nia. The story has a hint of forbidden love mixed in with the futuristic mind control. Nia was a fascinating character. She was so different from the cookie-cutter girls usually found in Candor. I loved how strong she was, even when the recordings tried to mold her into the perfect little lady. Not only did I enjoy Nia's personality, but I also liked how she changed Oscar for the better. She opened Oscar's eyes to a world not controlled by his father. Only then does Oscar begin to stand up against the recordings. The ending was pretty intense. Bachorz left the story hanging and could easily continue on in a sequel. I sincerely hope she does because I'm dying to know what happens to Oscar and Nia. I don't want to spoil anything, but it isn't exactly a "and they all lived happily ever after" type of ending. Even so, I recommend this one to most teen readers. It has romance, action, suspense, mystery, you name it. I will be reading this soon and hope I like it, great review!